Ebook met uitgebreide uitleg over het kopen van uw eigen powerboat. Dit boek behandelt alles wat u moet weten voor dat u een speedboot gaat kopen. Dit eboek behandelt alle wat u moet weten voor u een speedboot gaat kopen. Dit boek zal u veel geld helpen te besparen en helpt u bij het kiezen van de beste boot voor u en uw familie. Lees vooral ook de Engelstalige beschrijving achter de tab English. This book covers all the basics. Everything you need to know before buying a boat. This book will not only save you money but will help you decide on the best boat design for you or your family's needs. So, you are ready to buy your very first powerboat! How exciting! You can probably already see yourself out on the high seas, enjoying the wind, the sun, and the waves – doing what you know you love – boating! If you’re like most soon-to-be power boat captains, you’ve already planned your first boating trip, and the only thing stopping you from leaving this very minute is the fact that you haven’t bought the boat yet. The first question you may ask when you arrive at the dealership will most likely be ‘how much does it cost?’ But this really isn’t the first thing to consider. Neither is ‘how fast does it go?’ While these are questions that need to be asked at some point, they aren’t the first things to consider. A great deal of thought and research needs to go into purchasing a power boat – even if it isn’t your first one! There are many decisions to be made. First, you need to understand that certain elements of a power boat have a huge effect on the boats performance, handling, and safety. Not taking these things into consideration could result in a disaster on the open seas that you don’t even want to think about right now. Let’s just say that not taking the time to select the right boat for your boating needs could result in a tragedy, such as death. 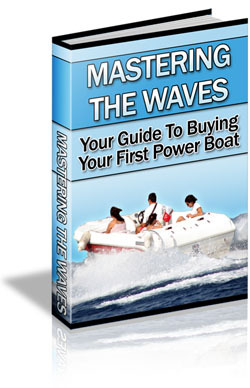 That’s what this guide is for – to help you learn everything you need to learn in order to make the right decisions when you go power boat shopping. By the time you finish studying this guide, you will arrive at the boat dealership well-prepared, and while you will still have plenty of questions of your own to ask, such as ‘how much is it?’ and ‘how fast does it go?’ you will be able to answer all of the questions that the salesman needs to ask you as well. Together, with help from your salesman, it won’t take very long at all to find and buy the perfect power boat for you. Just so that we are on the same page, so to speak, let’s start by defining exactly what a power boat is. A powerboat is any boat or water vessel that is powered by an engine. The engine may be an inboard engine, and inboard/outboard engine, or an outboard engine. The engine may be powered by gas or diesel fuel, but diesel fuel is usually used for larger powerboats. Steam is another method of powering a powerboat, and the first powerboat was in fact a steamboat. Obviously, this method of powering boats is out-dated and no longer used. Powerboats are typically between 10 and 220 feet long, and Yachts, which are considered to be powerboats, may be even longer. The price for powerboats can cost as little as $2000 for a small, used boat, on up into the millions for Yachts. Depending on the type of powerboat you buy, there may be sleeping capacity for 0 to 10 people on board. It is important to shop around. Don’t buy the first boat that you see at the first dealer you visit. Visit other dealers in your area, or even in other towns. Check out dealers websites online. Take a look at the used boats that are for sale as well – you may find a stellar deal! Read reviews on the various brands of boats that you are interested in. This is always a great way to start your research when shopping for a boat – or any other major purchase! Don’t pay attention to manufacturer type reviews – the ones that are sales ads designed as reviews. Look for customer reviews. Those are always the most enlightening. Finally, read through this entire guide. Print out the checklist that you will find at the end of the book, and take it with you when you go shopping for your first powerboat. Don’t assume that you will remember all of the things to ask or check! It is a known fact that customers who are well informed are the ones that get the best value and quality for their money. That’s the kind of customer you want to be, and this guide can help you do it. When you arrive at the dealership, and you tell the salesman that you are in the market for a powerboat, you may get a blank stare. Keep in mind that the term ‘powerboat’ covers a great many types of boats! It’s a good idea to know what type of powerboat you are looking for when you arrive, and to determine that, you need to assess your boating needs and desires first.